Nap time happens when nap time happens. For families who get around town on larger kid-hauling bikes, transit can be a lifeline. Get trapped across town when the clouds open up? Nap time arrives with miles left to bike? Kids get cold? Running late and need to take a transit shortcut? Unlike buses, which cannot hold most large bikes (like longtail or bakfiets-style bikes), Link light rail trains have space for large bikes, especially outside busy commute hours. So if there’s room on the train, it’s a great option for biking families. After all, rules allow four bikes per train car, two hanging and two standing. And a bike is a bike. Bikes are welcome on Sound Transit trains and buses, but room is limited. It’s a safety thing. In an emergency evacuation, for example, the doors can’t be clogged with bicycles. Because of that we’re letting our riders know we only have space for a certain number of bicycles. This is meant for the safety of all passengers. We also have restrictions on the types of bicycles you can bring on board. What you can bring are single-seat, two-wheel bicycles, including electric-assist bicycles. What we cannot allow are oversized, cargo, tandem or fueled bicycles (including motorbikes and mopeds) and trailers. I asked Sound Transit why this rule change was made, and Spokesperson Bruce Gray said cargo bikes have always been against the rules. “It’s always been there in the fine print,” he said in an email. But given that even I didn’t know the rule — someone who has reported about local biking and transportation news since 2010 — it’s likely that this comes as news to many other people, too. And for biking families who also depend on transit, this feels like a big hit to the way they get around. One positive clarification is that “regular” bikes with child seats attached are allowed, said Gray. But larger cargo bikes are becoming more and more popular for families around the region especially as electric-assist technology improves. And family biking is one of the most wonderful transportation movements our city has seen in recent memory. There must be some space for compromise. Bringing bikes on transit has obvious limits of scale. Many transit systems don’t allow any bikes at all, and our regional agencies have been leaders in efforts to connect transit and bikes (in the 90s, King County Metro was the first large transit system to put bike racks on buses). Today, there are plenty of trains that are not anywhere close to crush capacity, and people with large bikes can find space. Maybe this will change when a lot more of the light rail system is built out in coming decades. But in the meantime, developing an off-peak cargo bike rule makes more sense than a total ban. With UW and Capitol Hill Stations opening next month, we’ve been jokingly referring to U Link as the “Capitol Hill Bicycle Elevator.” UW Station is right off the Burke-Gilman Trail and for a few years will be the start of the line (so trains will start empty). For a couple bucks, you can skip the slog up the hill by taking a three-minute train ride for a couple bucks. That’s a pretty tempting deal. People have been using Beacon Hill Station this way for years. And since Eastlake Ave is such a miserable street to bike, taking the train from UW Station to downtown is also pretty tempting. Though this is as much an argument for building quality Eastlake bike lanes as it is for more bike access on light rail. Another part of the solution is high-quality secure bike parking at UW Station for bikes of all sizes. That way people can either walk the final legs of their trips, hop on Pronto Cycle Share or take a bus. Currently, there are lots of open-air coat-hanger-style racks in the UW Station plaza (the elevated path acts as a roof, which is clever). But as we have seen with other light rail stations, theft can become a problem since thieves know the bike owners have likely left them there for the day. Could an OHSU-style bike valet work here? UW already hosts a bike valet during home football games, so they have some experience with the concept. If people are bringing more bikes on the train than Sound Transit wants, they should get more ambitious about bike parking. And perhaps they should also be supporting Pronto Cycle Share expansion, which helps people avoid taking their personal bikes with them on transit. One easy way to do this would be to sponsor bike share docks near light rail stations, which could also help fund Rainier Valley and Beacon Hill Pronto expansions. Another common sense solution is to improve the interior design of the trains themselves. They could be much more versatile if at least one car in a train has an open floor plan. For example, some of Vancouver’s newer Skytrain cars have wide open designs perfect for accessibility, handling crush capacity crowds and moving people with carts, strollers or bicycles of all sizes. 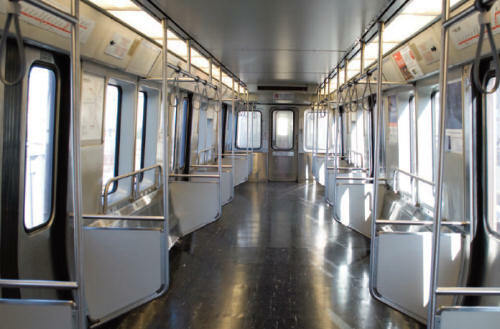 So rather than having the walled-off bike-hanging space Link trains have today, you would have a wide-open space with a railing so you can stand with your bike out of the path of the aisles or doors. Sound Transit will also be buying 118 new light rail vehicles to meet capacity needs as more stations open in the next couple years. “The manufacturer has not been selected yet, but one of the design criteria is to have more room for bikes on the trains. Exactly how many more is TBD,” said Gray. This entry was posted in news and tagged cargo bikes, family biking, sound transit, totcycle. Bookmark the permalink. This is a great round-up; thanks! I don’t *want* to bring my big ol bike on the train (and have only done so once) but I have a toddler and would like to have options so I can ditch my car for good! Bigger secured bike parking at my home station (Columbia City) would help me, personally. I would happily pay more for a bigger locker. Thanks for covering this in such detail, Tom. I had never realized this was a problem. I agree with all of SNG’s suggestions and hope Sound Transit will be more accommodating! While I’m sympathetic to the needs of cargo/family bike users, I think the current restriction makes sense given the limits of space and movement within the existing Link cars. A passenger bringing a cargo bike onto Link, which couldn’t fit on the bike hanger would add an unreasonable impediment to other passengers, especially those with physical disabilities. Given the alternating platform access at each station (left and right boarding) having a large cumbersome cargo bike at the door, which would need to move to the other side every 1-2 stations would become unwieldy at almost any time of day outside of late at night. In the interim, expanded bicycle parking (standard racks and secured cages) is a good solution. I also agree that future fleet expansion should include car layouts that allow for more space for standing room only passengers, wheelchair users, and bike riders. The MBTA in Boston already uses cars on their red-line subway for this purpose (http://www.universalhub.com/images/2008/bigredcar.jpg). I would add that I disagree with the statement (from Twitter) made by Tonya Ricks Sterr, quoted in the article. This is not, as the term is commonly used, “an accessibility” issue. The term accessibility has been used by people with physical disabilities that hinders them from accessing public and private space. There is not an equivalency here, and it comes across as insulting to those who have mobility issues as a result of a physical disability. I doubt that there was any ill intent, but I think people should choose their words more carefully in this regard. The inability to board a Link light rail car with a cargo bike is an inconvenience (I no doubt believe a large one). Not providing an elevator in a multi-story building is an accessibility issue, one that PREVENTS someone with certain physical disabilities access (and a host of associated social and economic benefits). Advocates should understand the political impacts of their words and statement. No. It *is* an accessibility issue. First of all, it’s not just cargo bikes, it’s all large bikes. For disabled people who need special recumbent bicycles, they are denied access. For people with balance issues who rely on tricycles, they are denied access. For people who are injured in any capacity who can bike but can’t walk (I stepped on a nail 2 weeks ago and still can’t put weight on it, but I can bike just fine), and who have a non-standard bike, they are denied access. I’d claim that it’s also an accessibility issue for families as well, but that’s a longer discussion. @ Chris Mobley, Not withstanding Andres Solomon point, while the term “accessibility” is commonly used with reference ADA accessibility it is also a long standing word in the English language that has a clear and broader meaning. While you might personally prefer to use a synonym for “accessibility” when referring to families, I think rather unreasonable to expect Tonya Ricks Sterr to do the same when her meaning is pretty clear. I fail to see why using that word in the context of families could be reasonably viewed as insulting of somebody with a disability. This is important. I’ve bike/bus/train/pretty much every multimodal option’d with a kid. I’ve learned how to successfully plan and position myself so everything can go smoothly, and other riders are happy. I brought a bike with a kid seat on light rail, *right when it opened*, & some ST workers measured it. Hanging from the hook, the kid seat stuck further out in the aisle, & was lower than you’d expect it to be. I popped the seat off after that, or just stood by my bike, but apparently even with the restrictions this is currently okay? Sound Transit should look at ways to encourage family biking that works. It would be best to have a roll-in solution, especially when traveling with a small kid, who needs to be extracted from the seat… Large bike parking boxes are a great idea. I understand the reasons behind this, but Sound Transit encourages biking, and Family Bikers need the option. I once had my son fall asleep on a trailer-bike (he was hanging on like a champ, but tourists pointing brought it to my attention!) Without the option to switch gears & take a bus home, I would have had a very rough time that night. I’d looove to take the new light rail just that one stop up Capitol Hill, and be able to shop and ride back down! The kid’s realllly excited, seriously. Please give us the chance to do this. I get where they are coming from, but I wish they actually studied what this is like in practice. When I was living in Rainier Valley with a longtail bike, I took it on the light rail all the time (well, never during rush hour) and it was not much worse than a standard bike would be when the racks are full. You have to be clever about positioning it (just as with a standard bike), but if you can fold up one of the accessible bench seats, drop your fancy double kickstand, and strap it with a bungee to a pole, it’s quite stable and unobtrusive. The peak time restriction is sensible, of course. In fact, now that I live in Chicago I occasionally take my standard bike on the El or the Metra (neither of which have bike racks, but both permit bikes outside of rush hour). In comparison to most CTA train cars, I’d say the Sound Transit trains are better laid out for standing bikes, yet the CTA ends up with a lot more free-standing bikes due to the lack of rack space. @Chris Mobley– actually, “Accessibility” is exactly the right word. You see, the new petition covers not only cargo bikes, but also larger mobility aid devices. My husband cannot travel by bus because the type of power chair he needs is one of the many styles cannot be maneuvared into the space provided on buses. An additional car or other measures dedicated to providing more space to patrons who need more would not only serve my cargo bike, but also his power chair. Also, hand in hand with e-assist technology improving comes the improvements in technology by which a mother in a wheerchair can push a specialized stroller, a father can take his disabled child to school out on a hand-cranked e-assisted tandem. Certainly, a policy prohibiting bikes of unusual size and dimension will by default prohibit the growing styles of specialized bicycles that are restoring independence to people with disabilities. Our society forgets that disabled people are not just individuals, but also family members, and that bicycles make things possible for more than just the able-bodied. Absolutely, this is an Accessibility issue in every sense of the word! Yes. Exactly all of that. Has anyone put a family bike on the train & got off downtown? What is it like using the elevators? Some of the stops downtown are easier than others to roll a bike in and out of. The best one is at International because you only have one elevator to deal with and can roll you bike in and roll out, no need to maneuver. With the added PBL on 2nd Ave it makes this stop easier than going all the way to Westlake and trying to jam a bike into an elevator that may or may not be opened. I know sometimes it is announced on the train but I had a situation where the elevator at University St was closed, I had a stroller that time so it wasn’t that bad but not everyone can manage a wiggling toddler, stuff and stroller up the escalator. The other elevator I LOVE is Beacon Hill. You can probably get 3 cargo bikes in there. It’s HUGE. Also, you roll in and roll out. I have always wondered why that one is so big. All the other stops require that you find two different elevators to reach the surface streets. Brock, if you are interested we can do some field test experiments regarding the elevators. I know Madi has some pictures but it would be worth it to note the elevator space, even for normal bikes. I am really curious abut the new station elevators and how those work. I once saw a bike+trailer combo on Link, and there appeared to be no way to position it to avoid limiting rider ingress and egress. The rider got off with me at Beacon Hill Station and, while the elevators are large, he had to fold the trailer over to allow the elevator door to close. Yes, it would be nice if public transit could easily accommodate all the various mobility devices that humans come up with, but I doubt that will happen. University Street Station has the ramp entrance at the SW corner of Benaroya Hall so would be a one elevator station. Thanks for the balanced article, Tom, and I loved that you used that picture. Mid-day link light rail was uncrowded and perfect at the time, but I could see that a long-tail like the one in the picture would be in the way on a crowded peak hour train *as currently configured*. I also would love to see more flex cars with fewer or NYC-style seats that leave more room for people and their wheels. In the meantime I’d like them to clarify a maximum bike length for peak hours, or allow any bike that fits on the hook. That would likely allow some “mid-tail” cargo bikes on board, although the hook requirement would eliminate plenty of biking parents (rough work getting a heavier bike to hang) … and the nap option. It sure would be nice if we had a transit system that didn’t require bringing a vehicle along with you! For me, I don’t see ever wanting to do it, even if it were allowed. Wrestling my big bike on to the train and managing all of the kids at the same time means I’d need to find another way to get there or I’d need to find a way not to go. Plus, with kids you never know if you’ll get delayed and 3pm turns to 4, turns to rush hour and then am I really going to wait until 7 before going home? I really think the emphasis needs to be on good bike parking at the stations, and we need to know what the actual risks are to leaving our big bikes at the station. In the Netherlands, where I’ve heard bike theft is rampant, I rarely saw a cargo bike locked to anything but itself. If we are buying new train cars and changing policy to bring bikes along just so they won’t be stolen, we are solving the wrong problem. Good bike parking means we don’t need to bring a bike along if we don’t need it on the other end, and that’s good for everybody. Given how much we are paying for light rail and given that Sound Transit has been struggling to meet its own modest ridership projections created at the outset of the project, you would think that they would be falling over themselves to accommodate everyone who wants to ride. Link is on track to beat it’s projectrion of 40k average boardings per day by 2020. Early on it struggled due to the Great Recession (Link opened in 09) but has been averaging double digit growth the last few years. @Matthew Johnson, I am not sure how long you have lived here but if it is for a while you do not have a memory to match. In 2003, Sound Transit was projecting just shy of 37,800 riders per day by 2011. Off course only a few years before that they were projecting reaching the U District by 2006. It is easy to meet your projections if you are allowed to revise them down to match reality (which they have done several times) and then have a large budget to publicize how successful you are. Moreover, since they will have opened up to Northgate by 2020, nobody at that point will be paying much attention to the ridership on the current footprint which I believe must be what you are getting the 40K projection for (it is 56K in 2017 for the whole system). Yes, you are correct that when Link opened in the middle of the Great Recession it did not meet pre opening projections. However since then it has been growing like gangbusters. Pre-opening, pre-recession (2005) estimates sent to the Federal Transportation Authority was 40,000 daily boardings by 2020. Link finished up 2015 at a bit more than 35,000. However it finished up 2012 at a bit more than 25,000. Last year it added 2,000 daily riders and in the last 5 months the rate has increased to an average of 2,500 a year. So as I said, Link is currently on track to beat initial estimates. I’ll be posting a new ridership report on Seattle Transit Blog soon which will have charts if you are a more visual learner. Sound Transit needs to take a cue from BART down here in the SF Bay Area… I take my cycle-truck (a Soma Tradesman) with a trailer on BART regularly and it’s perfectly fine. Non-cycling patrons are almost always courteous and cooperative when I follow BART’s bike rules. I also enjoy doing long distance self-supported touring, and was planning on a tour from Seattle to SF this coming summer. If Sound Transit can’t get over their myopic policy, I will gladly change my starting point to another city, such as Portland, instead, and spend more time and more of my money there than in Seattle. I ride Sounder, not light rail, and the rule requiring only “standard” bikes really has been there for years. But it’s also been widely unenforced for year — I routinely see longbikes, cargo bikes, and the occasional recumbent on southline Sounder. As long as they’re not actually blocking anything, they get a blind eye from staff. I would hope light rail gets the same treatment, at least, saving any enforcement for when something really is big enough to block the exits and create a hazard. That’s been the case so far, as I have taken my box bike on Link a few times. The announcement by Sound Transit is worrisome. They’ve re-posted and announced the rules periodically on Sounder over the years without ever having a crackdown, I would *hope* it’s just out there as a reminder so that if things do get crowded at rush hour, you’ve been warned. Back in the 1970s when Vancouver and North Vancouver, BC got the Seabus, “a passenger only ferry across Burrard Inlet that’s part of the transit system), it seemed too complicated for the authorities to figure out a solution so they just banned bikes all together. As it had been promised before the Seabus was set up that bikes would be allowed on it, people got together and sued them and they were forced to figure out a system. I’ve seen in Europe where the commuter trains have a car just for bikes. The doors are wider and you don’t have to use a hook and hang it either. I think it is a reasonable rule, it makes sense until they get bike cars on the trains. Trains are not huge like a ferry boat and a gigantic bike could be an obstacle for regular passengers. Also I think it would be only a very small percentage of cyclists that are put out by this rule. Probably bikes should be restricted to those that can go on the hangers, as would be the case on buses. Whether or not the Transit Authority is cognizant, they would appear not much concerned about encouraging or increasing the use of their trains – even where a need exists. A lot of bikes-on-transit stuff is kind of like that. When we shuttle bikes across 520 on bus racks, we know that can’t scale up to all the cross-lake commuters. Trains and buses can only take on so many bikes. The bikes they take on are part of larger sustainable transportation goals; they don’t make any of the rest less necessary. On the other end of the size spectrum, folding bikes are great for use on Link, buses, and streetcars. They are the size of a shopping bag when folded. On some UK commuter trains only folding bikes are permitted during rush hour. Sound Transit policy says that even when the racks are full, you can take your folding bike on if you can carry/hold it like luggage. In a perfect world with people who aren’t selfish, the rule could be simply “don’t be a douche”. People would plan their trips around non-peak times. Unfortunately, that’s not the case. My guess is that this will be enforced only when it needs to be. Of course this is the way it ‘should’ be. I’m reminded of my bike commute — Phinney Ridge to Bellevue and back. Often, waiting at the Evergreen Point mega transit stop to cross 520 westbound to go home, bus after bus has a full bike rack. Some drivers, if the bus itself is not full, ask one or more cyclists to hop into the bus itself and hold the bike in the aisle, even though it’s against Metro rules to do so. Other drivers, with an empty, deadheaded bus, just refuse this accommodation, even though the bus has no passengers. My experience with my bike + trailer on Link has been the same — depends on when, and who is making the decision about whether it’s allowed right then or not. Exactly, same as with all the rules around dogs on transit, they’re only enforced when there’s an issue. The problem in general is that bikes on trains don’t scale. But they scale even worse on buses. The thing is, it is a fairly simply system for buses — if there isn’t enough room for your bike (because other bikers are using it) you lose. It gets a bit more complicated with the train. It doesn’t make sense to force a half dozen people to take the next train because someone wants to get on using a bike. I completely agree that we should have at least one open car. Then things become a lot simpler. Just require all bikes use that open car. During rush hour, it is the opposite — ban all bikes, and the open car handles way more people. The same rule applies for big sporting (or similar) events. It is easy to anticipate and announce this (the open car will not be available for bikes from 12:00 to 1:30 and 4:00 to 6:00 on Sunday because of the Seahawks game). Meanwhile, add more bike lockers and save Pronto. Those do scale. Given the nature of our light rail system (where stations are few and far between) they pretty much are a necessity. If I wanted to go from the C. D. to Children’s on a regular basis I would use Pronto or buy two bikes and put them on either end. This is about poor train design, or lack of will to fund anything bigger than toy sized trains. And it’s not just about bikes, there is also inadequate space for large luggage (an airport train?) and wheelchairs. The aisles are too narrow, bike racks are hard to use (bikes not intended to be lifted over your head) and when used the handlebars project into the aislespace of passing passengers, creating safety issues. Personally, I avoid using those racks to avoid aggravating a sore shoulder. If a train attendant (fare checker?) wants to come along and help me by hanging up my bike for me, that’s fine, otherwise I will stand and hold it and try to keep out of the way. To remedy the situation, they should add an open space car. I wouldn’t mind if they charged a buck extra for bringing your bike. Face it, we are lucky bikes have been riding for free for a long time now on our public transportation system. However, I doubt they would collect enough from this to make it worth the effort, it would only make people think twice before bringing their bike on board and maybe reduce the traffic. Ever? Never Ever? I read that post a few times, and all the other posts, and I don’t see anything than says they’ll never provide space for oversized bikes. Also, they clearly are restricting large vehicles for safety in case of emergency. Safety of public transit is paramount, and if current design doesn’t provide a way to safely house larger vehicles, then that has to take precedent. One of the larger hurdles of mass transit is trying to meet the entire populace’s requirements for all systems at all times. This often stymies progress of mass transit, which, I think, we all agree is important. While I do understand your issue, and apparently plans to extend functionality of the link light rail. However, claiming accessibility is a bit questionable. Sound Transit provides Paratransit for people who are unable to use Link Light Rail, specifically to attend to issues of accessibility of people with mobility scooters and other devices. This is about bicycles with larger profiles. Paratransit cannot scale, it’s not the solution. Myself and others have already addressed (in the comments) whether this is really an accessibility issue. Finally, while I agree that safety is paramount, I think you’re kind of missing the point. Family bikes aren’t officially allowed, and that’s no good. We are advocating for a better solution. We’re not even asking for anything complicated; just open space that can be used for anything (including large bikes). This in no way stymies the progress of mass transit. Other public transit agencies are already doing it! What are they gonna do? Take your birthday? Just roll it on if their is space. What’s a cargo bike..what’s a normal bike? Transit cops can be thugs either way. Just do what they say and roll off. If nothing is said, carry on. Is there anything in the ST rules that specifically details what a “large” cargo bike is for the purposes of this rule (e.g., a maximum wheelbase)? Just thinking about a bike like the Rad Power bikes Radwagon and wondering how it would be treated under this rule. It’s an electric cargo bike, but not that long (51.2 inch wheel base, so 5.2 inches too long to fit on a Metro bus bike rack (and too heavy as well, fwiw)). Or does it sound like this is mostly a murky, discretionary rule that ST employees can deploy as needed? The reality is that ST employees probably won’t bother you about cargo bikes. I’ve taken my 8-9ft long box bike on light rail numerous times. The limiting factor is things like elevator size and crowds. If it’s too crowded, you won’t be able to maneuver a longer/heavier bike in or out of the train car. Avoid rush hours. The UW elevator is huge, but the Pioneer Sq and ID stations have tiny elevators. My bike doesn’t actually fit in the elevators of those two stations; I actually needed to pick up the front wheel to make it work. But a 5-6ft long bike shouldn’t have problems.